I still have yet to shoot the two rolls of CineStill 35mm film that I bought from Freestyle Photo months ago (many months ago). I guess I haven’t been in the presence of anything dramatic enough in tungsten light to warrant burning a roll. Anyway, that’s my own problem and I’ll shut up about it. CineStill is now crowdfunding the production of the same film in 120 size. But it gets better, at least in my book: some pledges get vintage 70mm film canisters as their reward, to store the film in. For some reason, I am a total sucker for schwag like coffee mugs and tote bags. But I absolutely love containers of all kinds, and how often do they show up as a fundraising giveaway? Have you any NPR boxes? Film cases with your local art organization’s logo? I think not. So head over here and check out the scene. 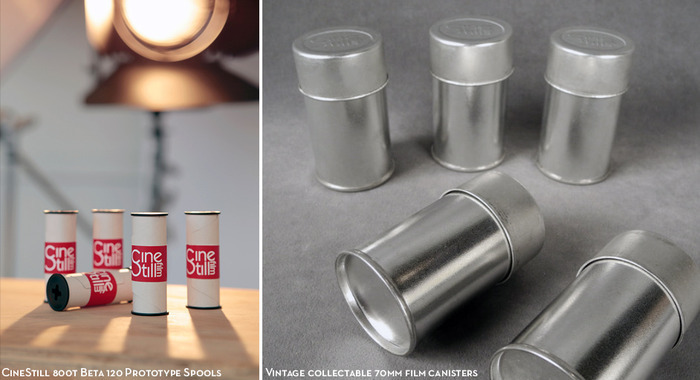 For $100, you can get 5 rolls of film and 5 vintage metal canisters!